A Facebook app "Understanding Alzherimer's" was created to increase knowledge and awareness about Alzheimer's. It also helped individuals who utilized the app to develop an understanding of the kind of care required for people who develop Alzheimer�s disease. 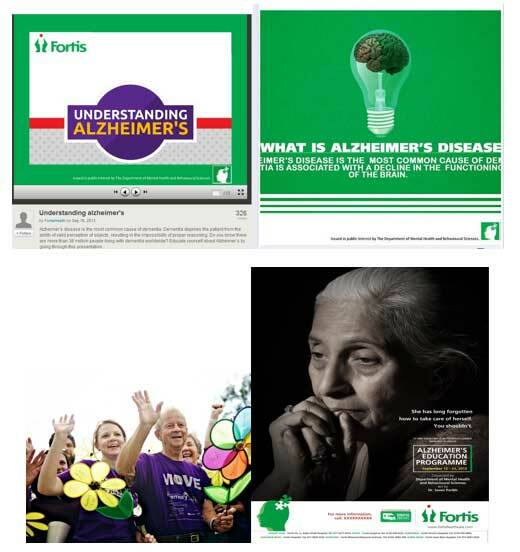 Various creative were designed and shared across the Fortis Healthcare social media platforms to generate greater understanding about the illness. The social media campaign resulted in 3,65,921 impressions. Talks were conducted through the Resident Welfare Associations in the areas surrounding the Fortis Healthcare facilities in Delhi-NCR. Displays were set up within the hospital premises in Delhi-NCR, Kolkata and Mumbai to generate awareness about the illness.